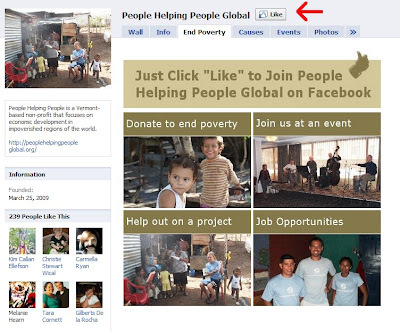 One of the quickest and easiest ways you can help People Helping People Global is by “liking” us on Facebook and inviting your friends to “like” us on Facebook too! With over 500 million active users, Facebook is currently the best way to reach the largest online community on the internet. 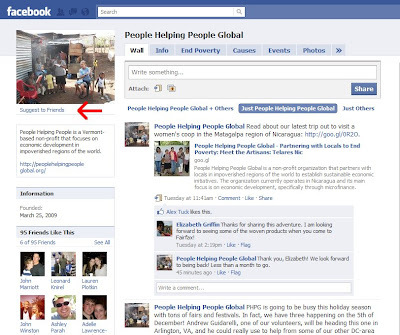 As a PHPG supporter, Facebook can function as your one-stop-shop for all information pertaining to our organization. Wondering where that last donation went? We post stories about the loan recipients and artisans we work with. Looking for a job? We post all of our new job openings on Facebook. Want to find out about upcoming volunteer opportunities? All of those get posted on our wall, too. Plus we set up events on Facebook so that you can see who’s going to be there! So, now that you’re convinced that “liking” us on Facebook is a great way for you and your Facebook friends to stay up-to-date about People Helping People Global, here are the steps to get you started (let the red arrows be your guide). 1) This one is pretty simple. Just go to http://facebook.com/microlending, and click the “Like” button at the top of the page. Magically, all of your friends will be selected, and you can go ahead with the instructions. However, you know your friends better than I do. If you think just an invite will work, then go for it! 5) Finally, click the “Invite” button. Your good deed is done for the day! After all of this is done, feel free to post on our wall and introduce yourself to the PHPG community. We always welcome questions, comments, and suggestions. This organization is just as much yours as it is that of the people who work for and receive benefits from it. Please help us make it better by letting us know how you think we can improve! Thanks for taking the time to do this, and take care! Yesterday morning, Isabel and I hopped a bus from the south market of Matagalpa to venture out to the women's cooperative of the Molina Norte region of Nicaragua, about thirty minutes outside of the city. It was a beautiful trip with tons of great vistas of the sprawling city of Matagalpa and the hundreds of coffee plantations below. As the bus crept up the mountain -- peaking at about 15 miles per hour -- Isabel and I chatted about what we expected to find at the Molina Norte women's cooperative. We've been working hard to diversify the fair trade offerings that we have for our American markets, so we were excited to add another group of amazing artisans to the repertoire. We arrived at the entrance to the cooperative, and were escorted down through the compound. We were surrounded by composted flower gardens, organic coffee plants, and tons of streams. This place had an appreciation for nature! When we arrived, we were greeted with five smiling faces, all attached to diligently working sets of hands. The unofficial leader of the group, Wilma Flores Escoto, got up from her loom to officially welcome us to the workshop. We quickly introduced ourselves to Wilma and the rest of the group, then the showcase began. The Molina Norte cooperative is one of the few groups in the country that work in fabrics -- namely because cotton is pretty rare around here. However, the ladies purchase the colorful Guatemalan cotton that many of us are familiar with and create their own unique styles of purses, wallets, and other products. After we snapped photos of about thirty different styles of bags, holders, wallets, et al., we asked for a bit of an explanation of how the products are created and how cooperative works. We received quite an extensive explanation (but we'll save that for a different post). The most important thing that we learned is that the money is placed in a joint bank account, and each of the women receives an equal pay -- these ladies are getting 100 percent of the profits! We talked shop for a bit and made some final decisions about what we would purchase. The products are amazing, and we can't wait to offer them all to you this holiday season! We talked about setting up a contract for our return in the spring, and the ladies eyes lit up. It's not too often that guarantees get made here in Nicaragua. When all was said and done and hundreds of photos were taken, we said our goodbyes to our new friends, Maria, Desi, Wilma, Nadi, and Ramunda. They kept thanking us for coming, but obviously the pleasure was all ours. To get a glimpse into the day-to-day lives of these women was quite a treat, and we look forward to our next trip out to Molina Norte. Rainy season has taken a toll on just about everything here in Nicaragua, but most notably so, on the dirt roads. While biking out to a meeting the other day, this fact became quite apparent. The meeting was to be held at Elisa’s home, which is located at the very end of the peninsula and a fine spot for a meeting… if you can get there. Yes, it was undoubtedly raining on this day causing me to question if I should even attempt traveling down this muddy, puddle-covered road. I had made my decision to make the trek despite the rain. In Nicaragua everything is cancelled when it rains. Schools close and children are prohibited from leaving their home because it is a “known fact” that they will become sick if they get wet. Being quite tired of rain (or even the potential possibility of rain!) and being used to the normal excuse to cancel, I decided to go ahead with the meeting. I was not going to cancel and be hypocritical; however, after each pothole that shot mud up my back, I began to doubt my better judgment. Peddling away, my mind began to think of the group of people – hopefully – waiting for me at Elisa’s house. This group is compiled of fishermen and women from the island region of Granada. All in all, this region consists of 354 islands that were created hundreds and hundreds of years ago when the closely located, and still quite active, Mombacho volcano erupted, spitting rock and lava into the lake. Since then these people have lived and breathed off of the fruits of the land and of the lake. Each individual in the group will take out a loan with People Helping People Global to improve their fishing business. Most will buy materials to make nets and/or repair their boats. Oh no, I thought, with the rain and their leaking boats, it will be twice as hard, if not impossible for people to arrive. There I was feeling sorry for my own situation. With Elisa’s home is sight, the final puddle covering the entire road proved to be the death of me or at least that of my somewhat presentable appearance. My tires were half submerged in the puddle. Inching along, all I could do to not fall in was continue peddling – shoes, ankles and calves fully submerged. On the bright side I had arrived. Elisa came out and offered me a warm welcome as we laughed about my state. My laugh quickly turned into worry when I saw not a soul had arrived yet. As we waited, making small talk, time seemed to creep along. My hopes of having our meeting on this dreary day seemed to be passing by. Oh well, I thought, at least I had an adventurous afternoon. Just then, from across the field I began to see signs of life. Yes, they were coming! Our meeting would be held despite the conditions. Never lose hope...later is better than never. The goal of the meeting was to announce which individuals would be receiving loans for the first round in their community. I was dreading this part the most. When the time finally came where I would read the list of the lucky ones whom had been randomly selected to receive a loan, my heart sunk looking at all who were not on my list. Those not selected would have to wait until February when we return from our holiday fundraising stint in the US. As I butchered the pronunciation and stumbled through the list my anxiety grew, anticipating the disappointment of half of the group would feel when I finished. The time had come. I read the last name, and paused knowing the next step was to look up and address all questions. No doubt I would hear, “Why him, not me?” or “I turned in my request before her.” However, to my surprise, when I lifted my head I saw nothing but smiles, happiness, and peace among the group. I did not hear one complaint. There was no anger or hostility, even though each and every one of them is living in extreme poverty, hunger and poor health. A family making $15 dollars per week is considered blessed (with a family of 5 this would equate to less than 50 cents per person per day). Given the difficultly they all face, I still did not hear one complaint. I was praised for coming to their community and praised for offering this great opportunity. As aunts, cousins and neighbors began congratulating one another. I smiled to myself thinking, I guess they do have the right mentality down here in Nicaragua: never lose hope...later is better than never.